Sandoval said adopting the legislation was “premature,” echoing concerns from the state’s powerful casino lobby group. 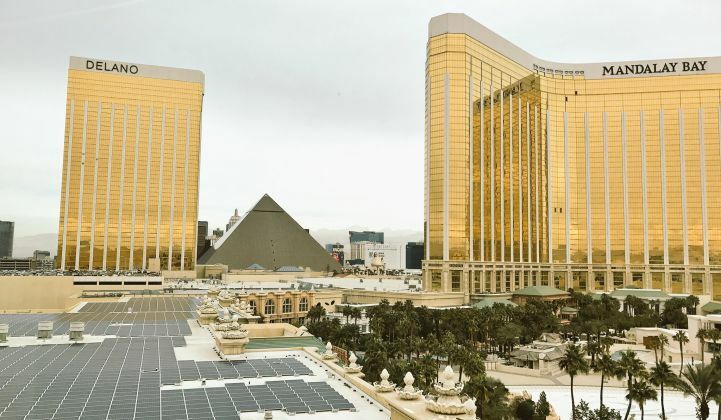 It looked like renewable energy advocates in Nevada were going to win the legislative Triple Crown last week, but two of the three clean energy bills in contention never made it across the finish line. Republican Governor Brian Sandoval vetoed the two bills on Friday, citing uncertainty amid Nevada’s pending shift to an open and competitive energy market. AB 206 would have increased the state’s renewable portfolio standard (RPS) to 40 percent by 2030, up from 25 percent in 2025, and created attractive new incentives for energy storage. The second bill, SB 392, would have established a 200-megawatt community solar program by 2023. On Thursday last week, Sandoval signed a popular bill (AB 405) that restored net metering credits for rooftop solar customers in the Silver State, giving the distributed energy market an enormous boost. Following that win, supporters hoped the RPS and community solar bills would get approval too. AB 405 appears to have complicated things for the community solar bill, however. In his veto message, Sandoval said he was concerned that SB 392 could conflict with the rooftop solar policy. Sandoval said he was also concerned about passing new energy legislation in light of the state’s pending Energy Choice Initiative, which could dramatically restructure Nevada’s electricity market if voters give the initiative second approval in 2018. Solar advocates argued that rejecting the community solar program flies in the face of public opinion. “Governor Sandoval’s disappointing decision to veto community solar access is at odds with the more than 70 percent of Nevadan voters who supported energy choices in November’s election, and with the overwhelming support for community solar from national security experts, faith communities, small businesses, and clean energy advocates,” said Jessica Scott, Interior West director at Vote Solar. Sandoval also cited the Energy Choice Initiative as his reason for vetoing the ambitious new RPS target, despite his overall support for the expansion of clean energy in the state. Nevada’s powerful casino lobby group was a strong opponent of AB 206, because it would have required large gaming companies, which recently paid tens of millions of dollars in exit fees to purchase power on the open market, to also meet the higher renewable energy targets. In April, Virginia Valentine, president of the Nevada Resort Association, wrote a letter to lawmakers that said, "We are concerned that this bill may be too much and too soon." Renewable energy advocates sought to reach a compromise with opponents by lowering the initially proposed RPS target from 50 percent to 40 percent by 2030, and by creating multiplier credits for energy storage. The law would have allowed storage to meet up to 10 percent of the overall RPS target. Sandoval’s veto kills Nevada’s novel energy storage targets. To address the energy market concerns raised in his veto messages, Sandoval tasked his Committee on Energy Choice to study the ramifications of a higher renewable portfolio standard, as well as a community solar program, and issue a set of recommendations ahead of the 2019 session -- the next time lawmakers in Nevada will meet. Renewable energy advocates are already positioning to override Sandoval’s vetoes in the next session. Assemblyman Chris Brooks, who sponsored the RPS bill, said he plans to work with corporate and clean energy stakeholders to bring back the measure in 2019. AB 206 was backed by Apple, Tesla, Unilever and several other prominent businesses, including MGM Resorts -- which broke with the casino lobby group in choosing to support the RPS proposal. Nevada electric utilities currently spend around $700 million each year importing fossil fuels, according to the Natural Resources Defense Council. Meanwhile, the cost of procuring electricity from large-scale solar farms has fallen by 80 percent since Nevada last changed its RPS target in 2009. In a recent report, NRDC found that AB 206 would have added thousands of megawatts of clean power to Nevada’s grid, while attracting billions of dollars in capital investment and economic development, and creating thousands of jobs. While many expressed disappointment that AB 206 did not get approved, the clean energy industry group Advanced Energy Economy highlighted several other legislative wins. In the last week of session, four significant energy bills were signed by Governor Sandoval: SB 150, which instructs the Public Utility Commission of Nevada (PUCN) to establish annual energy savings targets; AB 223, which directs 5 percent of efficiency program spending to programs in low income communities; SB 204, which requires the public utilities to investigate the need for an energy storage procurement requirement; and Senate Bill 65 that allows the PUCN to prioritize energy resources that reduce energy cost and demand.